Examination of electron micrographs of longitudinal sections (left) show M-bands with 3-5 dense stripes in the middle of the A-band. Examination of transverse sections (middle) show a striking hexagonal meshwork linking neighbouring thick filaments. Combining these views leads to the simple M-band model (right) (Luther & Squire, 1978). 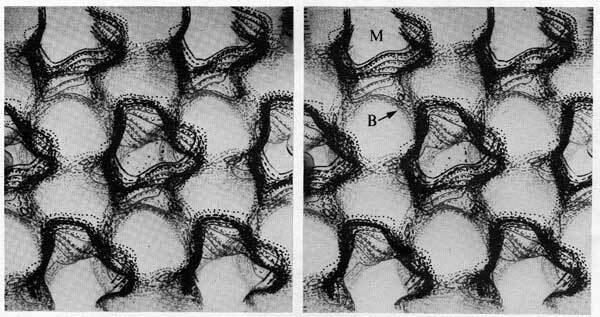 Stereo view of 3D structure in fish M-band (Luther & Crowther, 1984). Bony fish are unique amongst vertebrate in that their myosin filaments (labelled M above) have the same orientation within each sarcomere. This enhanced order makes fish muscle ideal for structural analysis. Here the M-bridges (B) crosslink the myosin filaments in the lower half of the stereo depth, while the upper half shows myosin filaments with triangular shafts in the bare region. This stereo view shows that the M-band is not as simple as shown in Luther & Squire (78). This figure from Squire, Luther et al (2005) shows the story has still many interesting chapters to go!